I had been keeping an eye on the spot for weeks. I thought it was a bug bite. I thought it would go away. But it didn’t. Finally, on the first free morning I had, the morning I was set to go on silent retreat, I googled my symptoms and found out I was dying. Well, I’m not dying (I repeat: NOT DYING), but that morning, based on what I read online, death suddenly seemed like a plausible possibility. Not only was my symptom a possible sign of something bad, it was a symptom of something very bad. I called my Dr and made an appointment for the following day. I called back again and said I’d be more than happy to come in that very day if they happened to have a cancellation. Then, with nothing more to do, I left for my scheduled retreat, for six hours of silence and solitude with the news of my own impending death tagging along, an unwelcome, nagging companion. My husband and I recently learned about an app called WeCroak which sends users a text, five times a day, with a simple reminder, “Don’t forget, you’re going to die.” The text arrives at random intervals (like death) and keeps things simple, clear, and direct. My husband learned about it through a counselor, discussing humanity’s fear of death as a source of generalized anxiety. I heard about it from my Spiritual Director after sharing about my silent retreat. “These kinds of experiences can help us wake up,” she said. One would think a silent retreat, with death as your companion, would be The. Worst. But, it wasn’t. After driving to the tiny house in the woods, I sat in the kitchenette drinking tea. Surrounded by windows, I watched bees flitting from plant to plant. Upstairs, later, I rocked in a cushioned chair, reading Richard Foster’s, “Freedom of Simplicity.” When reading grew tiresome, I stared out another set of windows and watched witless carpenter bees droning in lazy, senseless circles. I took a nap, half-wrapped in a downy quilt, while the sun shone down on me. I woke to a stink bug landing too near my face. Don’t get me wrong, I was distracted. I fought back tears from time to time and found it nearly impossible to focus on my original intentions for the day. I spiraled into moments of worry and anxiety. Except, that is, for love. Later in the day, I ate my lunch sitting in an old Adirondack chair near a wide and lazy creek. The surface of the water hardly seemed to move at all. If I shifted my focus, I could see long fish swimming loops along the muddy floor. Dandelions, with heads gone white like old lady’s hair, stood along the edge of the water, bearing witness, I thought, to its passage. 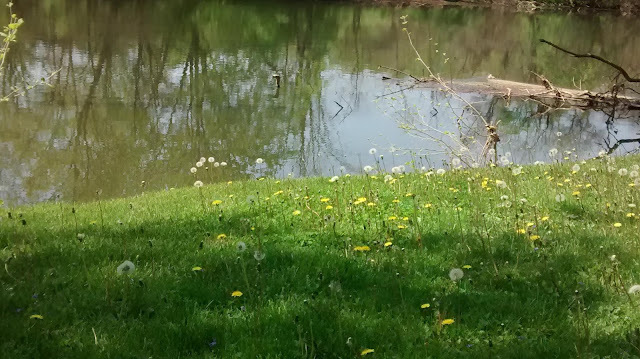 Those dandelions are, I’m sure, gone today. But the creek remains. It seems to me, that love must be something like that stream – constant, slow, enduring, and we are like those fading flowers on the shore. In which case, the only sane thing to do is cast ourselves, wholeheartedly, into love’s great stream, to become – with heart, soul, and mind – part of the love that never fails. Death’s message was clarifying and simple. It put my world, which I thought had been tipped on its head, right-side-up again. It brought my feet closer to solid ground, which is to say, it gave me level footing in the land of acceptance. I did not make peace with death over the course of six silent hours spent in the woods on a sunny Wednesday in early May. I’m not that naive. But I did catch a glimmer of a gift hiding in death’s hand, enough to make me understand what we lose living in a time and place where death is treated as an inconvenient truth, a reality best avoided at all costs. You can read more about the WeCroak App in this article in The Atlantic. Let me know if you try it out! So love your writing. Nothing like a potential brush with death to liven our senses, wake us up, appreciate those in our lives, absorb all the wonderful things in nature you describe, contemplate our own mortality and how life will continue after we go. And on the other side of all this, there is an amazing spiritual body we will receive, we will be present with the Lord in eternity. The love we leave here will carry those we leave behind until we see them again.